This lasagna recipe I got from an old “McCall’s Cooking School” cookbook. I have tried other recipes but I keep going back to this one. It seem to be a favorite every time I serve it. I will give you the recipe as it is in the book and put in (parentheses) the changes I have made to the recipe. You can make the sauce ahead of time. Remove sausage meat from outer casings; chop the meat. In 5 quart Dutch oven, over medium heat, sauté sausage, beef (break up with wooden spoon), and onion and garlic, stirring frequently, until well browned – 20 minutes. Add sugar, salt, the basil, fennel, pepper, and half of the parsley. Mix well. Add tomatoes, tomato paste and ½ cup of water, mashing tomatoes with wooden spoon. Bring to boiling; reduce heat; simmer, covered and stirring occasionally, until thick – 1 ½ hours. In 8 quart kettle, bring 3 quarts of water and 1 tablespoon of salt to boiling. Add lasagna, 2 to 3 at a time. Return to boiling; boil, uncovered and stirring occasionally, 10 minutes, or until just tender. Drain in colander; rinse under cold water. Dry lasagna on paper towels. Preheat oven to 375 degrees. In medium bowl combine ricotta, egg, remaining parsley, and salt. Mix well. At this point you could refrigerate and bake later or freeze. You notice that it says it serves 8, but that would be 8 hardy servings. The last party I had 10 guests. I did not want to risk not having enough… so instead of making two lasagnas and having lots of leftovers I made meatballs and served them with the lasagna. We actually had leftovers of both and everyone went home full. If you look at the meatball recipe it takes 2 1/2 pounds of hamburger and 1/2 lb of sausage. 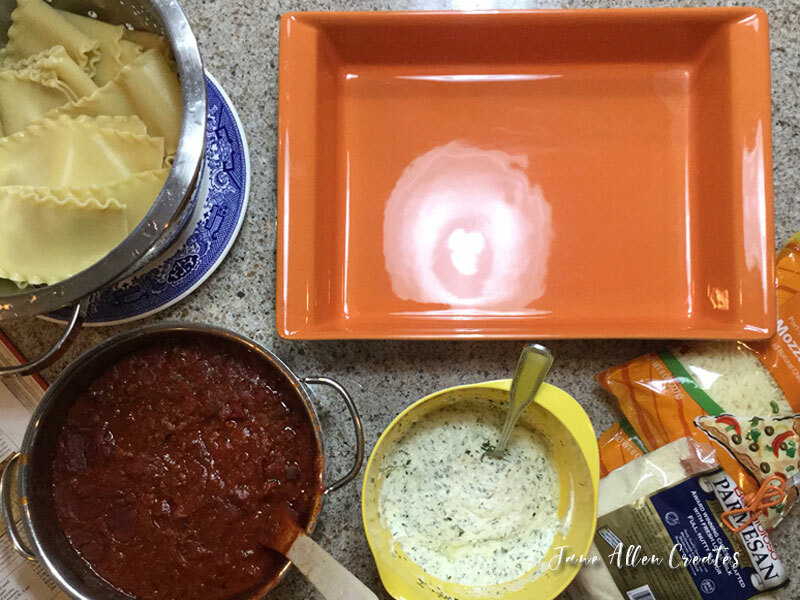 The lasagna recipe takes 1/2 lb. of hamburger and 1 lb. sausage. My store sells 3 lb. packs of hamburger and 1 1/2 lbs. of sausage so it works out perfectly for me. I just use a jar of bought sauce for my meatballs. I like that this can be made ahead so that you can enjoy your time with your guests and not be spending all of your time cooking. I hope you and your family will enjoy it. Looks delicious Jane! Hoping to make lasagna for Christmas Eve. Thanks for sharing! Looks yummy! One of my favorite meals. Thank you Charlotte, wish we could share the meal together! sauce looks yummy! Hope to make this recipe soon! thank you!